"Learn languages completely free, without ads or hidden charges. It's fun, easy, and scientifically proven." 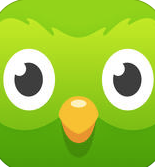 The site claims that if you use Duolingo for 34 hours you learn as much as language as you would in one term at university. I decided to try out the Duolingo App and see whether this approach was indeed "fun and easy". My experience of basic Spanish was initially quite exciting. I could chart my progress and I was encouraged by being awarded badges to acknowledge my success. A daily email would remind me to spend some time practising my new language and the phone app was convenient and easy to use. The initial excitement, however, soon wore off. I found the Duolingo translation approach very formulaic and repetitive and I was not producing my own language, but reproducing language that had been introduced to me. Duolingo's approach to language is very lexis-orientated. With no explanation of grammar rules a learner has to absorb grammar by association and I feel that this tool does not provide the strong foundations upon which a language learner can build their own knowledge. It's also a very lonely language-learning experience, with no interaction or social engagement built in, so it is very difficult to maintain motivation. That said, I think that it can be useful for learners to enhance the skills and practise language they learn in the classroom. The repetition aspect is good for pronunciation, spelling and an awareness of word order. Advanced lessons are classified according to topic, so learners could use the app, not in the linear way that it has been designed, but to cherry pick topics and structures they need to improve. "This app has taught me a ton of vocabulary, but I'm still not sure I know any real grammar – I don't exactly know why the conjugation of verbs that come afternosotros (we) are how they are. Or what the system is that governs the other verbs that might follow that pattern." 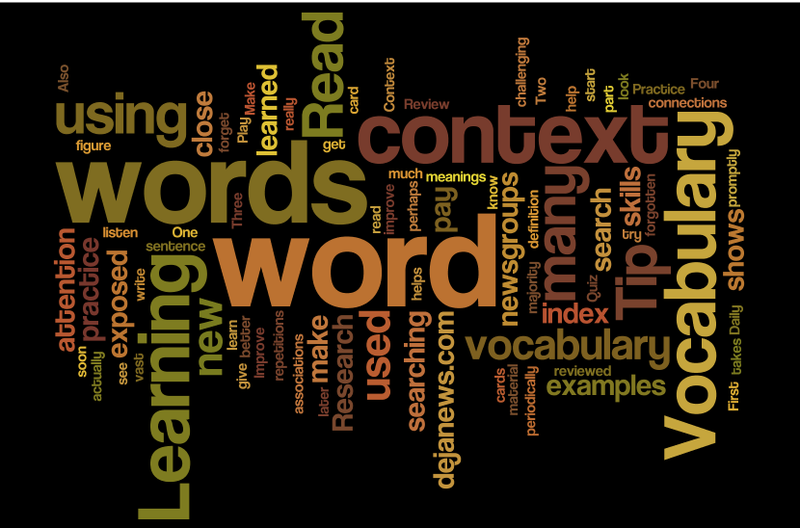 With this tool students can hear, practise and recap words and lexical chunks. 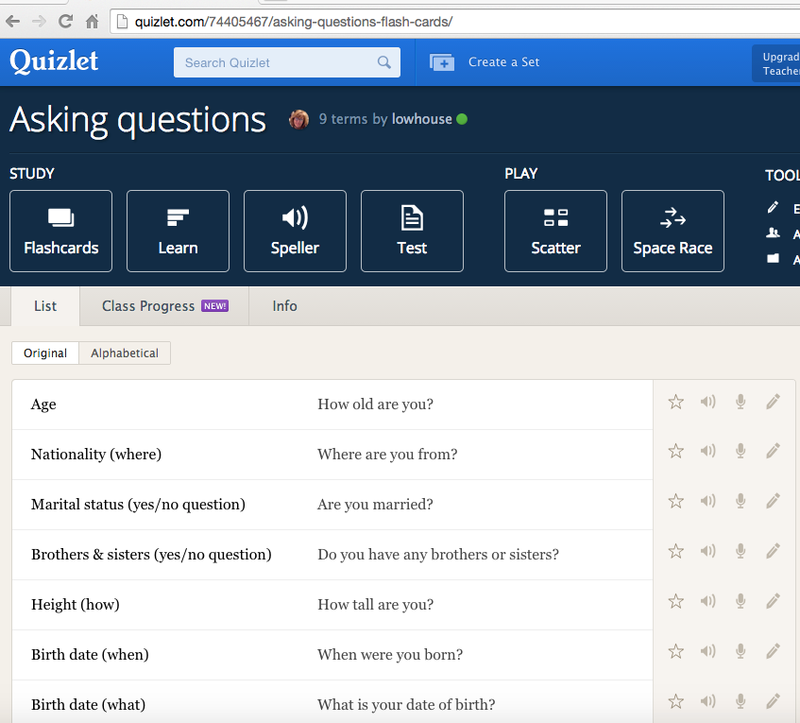 Quizlet enables teachers to produce flashcards, which can be used by the student in a variety of ways. This is all about learning through repetition and drill and the main difference between signposting students to this site rather than Duolingo is that the teacher has control of the vocabulary input and can therefore customise activities to suit the level of the learners and the specific topics they are working on. It took me a few minutes to produce a set of 10 flashcards for students to use in their own time if they wish to practise question formation. This activity also reinforces simple sentence structure, ensuring there is a capital letter at the beginning and that correct punctuation is used. The format is very formulaic and if used too often I think students would quickly tire of this. However, it could be put to good use on a few occasions to encourage learners to practise vocabulary, spelling and lexical chunks in different ways. Practise forming questions on this Quizlet. You can learn the phrases through flashcards and writing exercises, play games and test yourself. 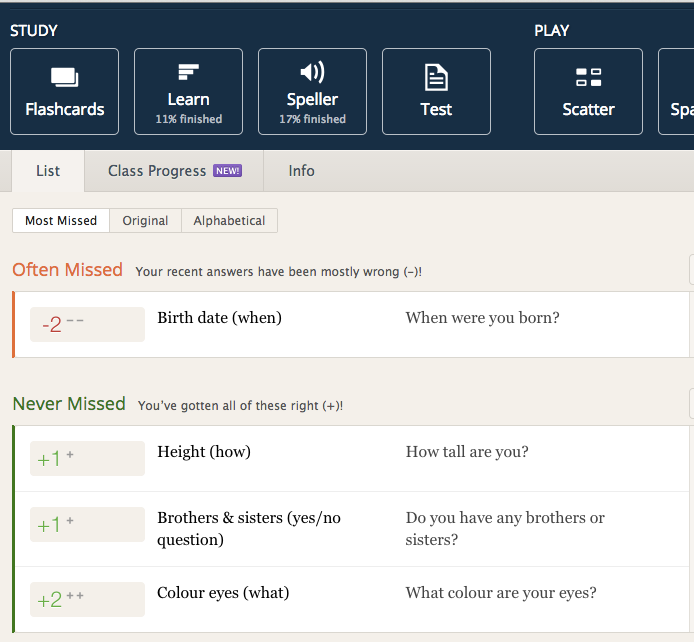 The site gives learners feedback on their progress, highlighting phrases or words they might be struggling with. Quizlet promotes behaviourist learning, but gives learners the opportunity to engage with vocabulary and spelling skills in an environment that has elements of gamification. I can see it being beneficial for those learners who make repeated spelling mistakes, seemingly unable or unwilling to learn from corrections. Arab students, in particular, struggle with spelling and I think they would enjoy this gamified aspect to vocabulary input. 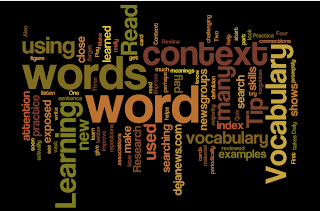 It's certainly more fun than learning vocabulary from a list and it could therefore be suggested that the tool can promote engagement and autonomous learning. To use it in a more constructivist way, a teacher could get the students to produce their own quizlets, based on a certain topic or language focus. This would not only reinforce language learnt in class, but also require the students to reflect on their own learning. Thanks for your comment. I've tried to learn Turkish through Busuu, but again lost the motivation to continue. I really feel there is no substitution for classroom , face-to-face interaction, but I do think it might be a generational thing. Perhaps young learners today (the ones who have grown up with social networking online) are more comfortable with interacting digitally.